Painter of portraits, including many distinguished contemporaries, figure compositions, landscapes and flowers; draughtsman, etcher and lithographer. Born 4 January 1878 in Tenby, Wales, brother of Gwen John. Studied at the Slade School 1894–8; won a Scholarship 1896 and the Summer Composition Prize 1898. First visited Paris 1900; later travelled in Holland, Belgium and France; was influenced by Rembrandt, El Greco and the Post-Impressionists. Began exhibiting at the N.E.A.C. 1900; member 1903. First one-man exhibition at the Carfax Gallery 1903. Professor of Painting at Liverpool University 1901–4. Painted in Ireland, Dorset and Wales, where he camped with gypsies and worked with Innes and Derwent Lees 1911–14. Exhibited at the Chenil Galleries, Alpine Club Gallery, Independent Club, Independent Gallery, etc. A.R.A. 1921, R.A. 1928, resigned 1938, re-elected 1940. 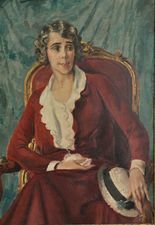 Member of the London Group 1940–61. Awarded O.M. 1942. Travelled widely in Europe and paid several visits to the U.S.A. and Jamaica. Lived in Dorset, London and later in Hampshire. Retrospective exhibition of drawings at the National Gallery 1940, and of drawings and paintings at Temple Newsam, Leeds, 1946; Welsh National Eisteddfod, Bridgend, and Welsh and English tour 1948–9 (organized by the Arts Council); Scott and Fowles, New York, 1949; R.A. Diploma Gallery 1954; and Graves Art Gallery, Sheffield, 1956. His Chiaroscuro, Fragments of Autobiography: First Series was published in 1952. Died at his home at Fordingbridge, Hampshire 31 October 1961.